"Come now Harry, the Ministry doesn't send people to Azkaban for blowing up their aunts." This recipe came about as a literal shower thought. There I was, washing my hair like a normal muggle, when the idea of a Harry Potter dessert pun came to mind. Popcornelius Fudge. Does that ever happen to you? A pun so fun you can't not make it? In developing the recipe, I started with the popcorn. Stale or soggy popcorn is terribly unappealing, so I kept it crisp by coating it in caramel. Building on the "sweet and salty" theme, I thought sea salt and dark chocolate fudge would be the perfect complement for the base. So here it is - a smooth, rich dark chocolate fudge, topped with the salty crunch of caramel popcorn. Not an experienced candy maker or baker? Not a problem - this 8-ingredient recipe comes together easily and without specialized equipment. Short on time? Want to cut it down to a 4-ingredient dessert? Use store-bought caramel popcorn! Makes for a very fast Harry Potter potluck dish. 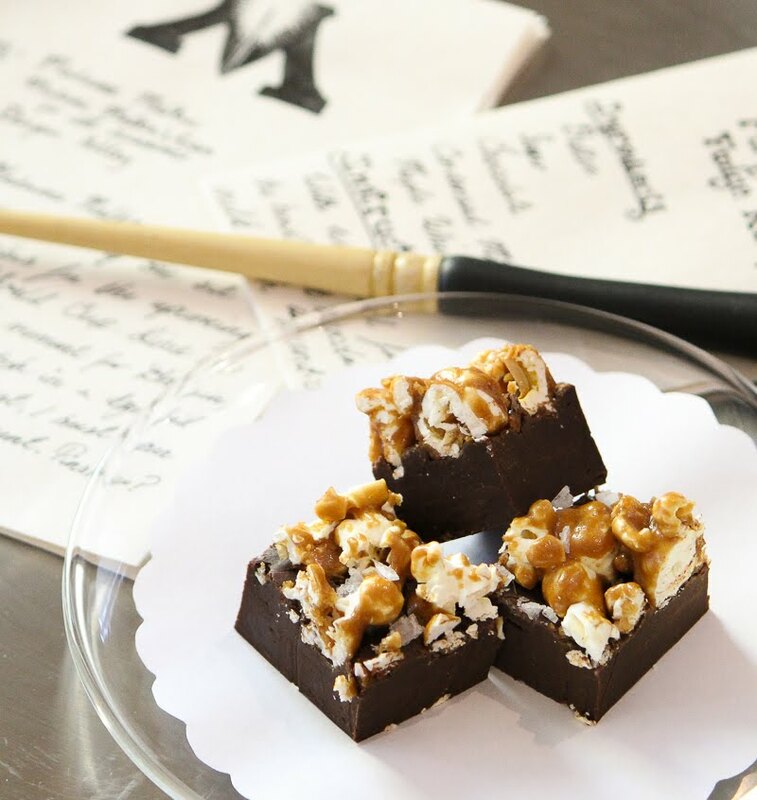 For an even quicker fudge recipe, use store-bought caramel corn! I used part of a bag of microwave popcorn, whatever you have on hand is perfect! In Harry Potter and the Half Blood Prince, Cornelius Fudge shares a glass of "amber liquid" with the muggle Prime Minister. I thought bourbon seemed both Fudge-y and fudge-y enough. Vanilla extract also fits the bill, or you could omit entirely. Fleur de sel or whatever fancy flaky salt you've been wanting to try out also works! Quick tips: Caramel and fudge both make sticky messes, but even the hardest of caramel pieces can be cleaned off after a quick soak in warm water. Caramel is very hot when it boils; resist the urge to sample it until it has cooled considerably. Start by making the popcorn: Preheat the oven to 250°F. Cover a baking sheet in parchment paper. Put the popcorn in a large bowl - we are going to toss it very quickly with the caramel sauce later, and we don't want to spill it all over the place! In a small sauce pan, melt the butter over medium heat, then whisk in the sugar, corn syrup and salt. Bring the mixture to a boil, stirring constantly. Once boiling, let it bubble away for 4 minutes without stirring. Working quickly, remove the pan from heat, stirring constantly as you go. Pour the caramel over the popcorn in a thin stream, then toss to combine. The caramel will begin to harden rapidly, so try to avoid large gloops. Spread the caramel-coated popcorn out on the baking sheet, and bake in the oven for 45 minutes, stirring every 15 minutes. Break up any remaining chunks and let cool. Next, make the fudge: Find a pot and a thin-walled bowl (stainless steel, for example) such that you can rest the bowl above the pot to make a double boiler. Fill the pot so that the water level rests an inch or two below the bottom of the bowl. Grease an 8x8 baking dish with butter or non-stick cooking spray, then cover it in parchment paper, then grease the parchment paper in butter too. Overkill? Perhaps, but I don't know a spell called expellifudgius. Bring the water to a boil. Meanwhile, combine the condensed milk and chocolate chips in the bowl. As the water approaches a boil, rest the bowl on top of the pot. With a spatula, stir until the chocolate chips have completely melted. Pour the fudge into the greased pan, using the spatula to press the fudge into the corners and smooth the top surface. Sprinkle the top of the fudge with sea salt. Let it cool at room temperature for at least 10 minutes. Assemble the popcorn fudge: While the fudge is still malleable, and once the popcorn is cool enough to handle comfortably, press the popcorn lightly into the fudge. Pack the kernels close together for a more even topping. Chill the popcornelius fudge in the fridge for at least 1 hour. Cut into squares using a sharp knife. Store in the fridge. Fandom Foodies' Harry Potter theme month, "#PotterPotluck" hosted by The Gingered Whisk. Foodgawker, as "sea salt and caramel popcorn fudge."